Last night I went to a show to see one of my favorite bands play. We Were Promised Jetpacks just released their sophomore album and last night was the final stop on their U.S. tour and the first time they were the headliner. Last night was also the third time I saw them play and each time they get better and better. John and I had an awesome spot on the balcony along the rail and the perfect view of the stage and all of the band members. As we waited for the lights to dim after they cleared the stage and set up the equipment for We Were Promised Jetpacks, I noticed that the stage was very clear and there were five guitars laid out. We Were Promised Jetpacks only has four members. I don’t remember them switching guitars at previous shows like some of the heavy alternative rock shows I went to in high school, but whatever, the lights were dimming and they were coming out. The drummer, the lead guitarist, the lead singer, and the bass player all came out on stage. And then came two more. 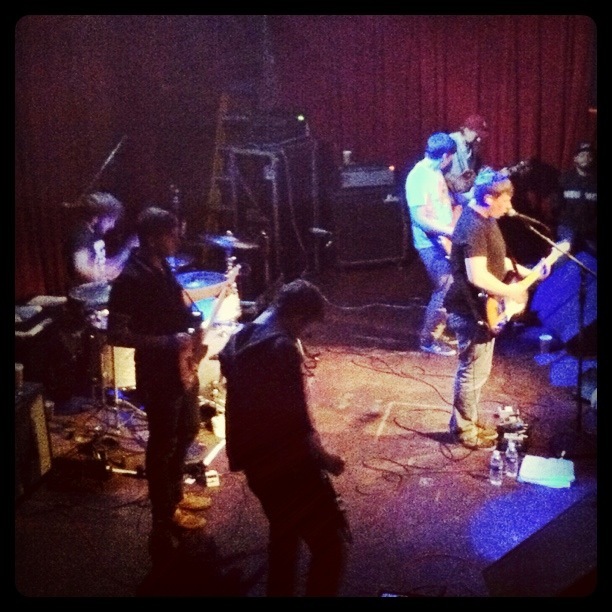 They started playing – the four men of We Were Promised Jetpacks who I had seen before and two more. They played their radio hit from their second album and then rolled into the song that made them famous (at least in my book) – with five guitars. Want to know how to impress your customers and turn them into lifelong fans? Surprise them with what they’re least expecting. Turns out the additional members came from the opening band, Bear Hands. We only caught the tail end of their set, so we didn’t recognize them. But, man, the whole time they were playing – and again during the finale – it just blew me away. Whenever I hear their music in the car or on the radio, I feel warm and amazed by their sound. But last night, they just increased my utter respect for them. I have no idea if this was an icing-on-the-cake, only time that these two bands performed together or if they did that set at every show, but I don’t care. The energy that flew out of those guys during that performance started their show off with the right level of bang and exploded into one of the most amazing concerts I’ve attended in awhile. Was I impressed before? Yes. Am I even more hooked on them – their music, their product? Absolutely. And now you are too. This entry was posted on Wednesday, November 16th, 2011 at 10:35 pm and is filed under life & observations. You can follow any responses to this entry through the RSS 2.0 feed. You can leave a response, or trackback from your own site.